THERAPI Signature Cleanser is a multi benefit gentle cleanser for all hair types whilst Brightening Cleanser reduces brassiness in blonde, white or grey hair. Free of Parabens & Sulphates along with Colour Lock to prevent colour fade. Our secret ingredient is Baobab which has unique moisturising, strengthening and anti-ageing properties. 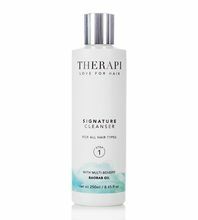 Our shampoos are available in two sizes, a 250ml and a 1000ml which is dispensed by a pump. Perfect for brightening tones and reducing brassiness in blonde, white or grey hair.